The holiday lights are an international attraction in Southwest Brooklyn. My walking-only tours (but not bus tours) require about 2.5 miles of walking, so please be prepared! 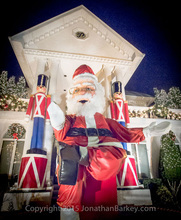 The Brooklyn neighborhood of Dyker Heights is internationally famed for its Christmas lights: dazzling, over-the-top arrays and even animated figures that represent the holiday season. 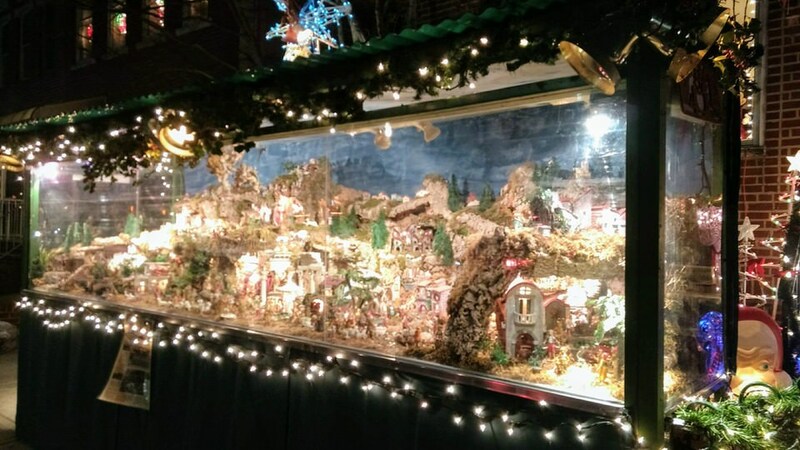 In 2015, Redfin called Dyker Heights the country's best neighborhood to see holiday lights. In 2016, Oyster.com did the same. The popularity has led to significant crowds and even some backlash (which is why we need to be respectful visitors). On our tour, I'll take you on the best blocks and explain how it started. Sometimes--often--we run into the proud homeowners. ​I can also show you other neighborhood highlights (pastry shops, mmm...) and explain how this part of Brooklyn evolved. Yes, other companies that offer daily large-group bus tours. I offer more personalized service and a more extensive route, on walking tours. For example, we can see a charming presepio, a labor of love by a local artisan, that is a traditional Italian village scene, built in what looks like a giant aquarium. See below. That said, it's much quieter in the early part of the season, so the trade-off can be worth it. Weekends can be very busy, especially as Christmas approaches. Lights start coming down after Christmas, but mostly remain up through New Year's Day. Lights generally lit up dusk through at least 9 pm. Depending on the size of the group, the scope of the tour, and the choice of transportation (foot or vehicle), we generally need 1 to 2 hours in Dyker. The shorter time period is if you have a vehicle and/or don't want to walk much. Dyker Heights is in the southwest part of Brooklyn. From Midtown Manhattan, Dyker Heights is about 50-60 minutes by public transit and 35-50 minutes by vehicle. It's still a fairly long trip by vehicle or subway from Downtown Brooklyn or Lower Manhattan. I recommend combining the visit with some other stops in Brooklyn, often starting in daylight, then getting to Dyker Heights after dark. See examples at right. A smaller group can be more nimble and see more of the neighborhood, including the main shopping street, Dyker Heights Boulevard, which has several bakeries. I also can recommend restaurants for dinner before or after the tour, nearby or a short ride away in Bensonhurst or Bay Ridge. There are a good number of options, including fast food (pizza, burgers), steakhouses, and restaurants featuring Italian, Middle Eastern, Greek, and other cuisines. Click the minus sign (−) on the map to see that Dyker Heights is far from other parts of Brooklyn and New York City. I am available for bus tours (generally organized by third party travel companies) that start in Manhattan or Brooklyn. Such tours often include a stop at another Brooklyn location. Given enormous crowding starting by mid-December, I strongly recommend bus tours aim for the earliest part of the month. Please note: you can only see a tiny fraction of the lights from a bus; it must drop the group off, and then the group must walk. We only walk five or six blocks--that's the limit for large groups--but it's possible to have a great time and see some great lights. The narrow sidewalks can be very crowded. A smaller vehicle can take us through many but not all streets. I also lead smaller group tours on foot, arriving in vehicles or public transit, starting in Manhattan or Brooklyn. A vehicle costs $50-$70/hour beyond my fee, but is faster and protects against weather. I cannot book a vehicle for you but can suggest some companies to try. This can be more unwieldy than simply going to a company with a package deal, but it should cost less. If we have a vehicle, we also can extend the tour of lights to locations in Bay Ridge, which has some great blocks with lights, no crowds (usually), and some lovely architecture. Taking public transit to Dyker is inexpensive but doable, as long as you can walk, as the main attractions are not near the subway. But walking will give you more of a feel for the overall neighborhood, avoid crowds for a period of time--plus it's easy to stop for food or snacks. After the tour, a public bus or car service will be available. We also can mix and match public transit and taxis. If we leave during daylight, we can easily stop in DUMBO, where there are great views of Lower Manhattan. It's also possible to visit row-house neighborhoods like Brooklyn Heights and Fort Greene, or Orthodox Jewish Borough Park, and/or Chinese/Latino Sunset Park along the way. If you are coming by subway, or by taxi--or if you're hiring a vehicle for the night--I can also meet you in Dyker Heights. Figure up to 2 hours in Dyker. My fees (click here for details) are based on size of group and time spent, but figure 2 to 3.5 hours (or longer), depending on where I meet you and whether we add anything to the route. ​ If you're just meeting me in Dyker, that's a short tour. Let me know your preference, including transit options. ​Note: I typically am available on Christmas Eve and Christmas Night.